Vajrasattva (Tib. Dorje Sempa) is the Sambhokakaya, one aspect of the form body which can accomplish the benefit of sentient beings. The Sambhogakaya is the unobstructed, self-appearing aspect of the Dharmakaya. Without causing even the slightest change in the nature of the Dharmakaya, the Sambhokakaya manifests as self-arisen wisdom awareness. The expression of the Dharmakaya as the Sambhogakaya is called the Direct Mind Transmission of the Buddhas. 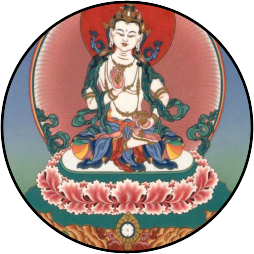 The deity called Vajrasattva embodies all buddha families, and is widely practiced throughout the Vajrayana Buddhist tradition to achieve purification.